During the second week of January, Class 51 cadets traveled to Camp John J. Barnhardt located on the William C. Cannon Scout Reservation in Stanly County to participate in confidence building activities and perform service to community duties. Cadets engaged in rappelling exercises on the rappelling/zip lining tower located on the 1000 acre reservation after learning Boy Scouts of America safety procedures and rules from certified BSA staff. Each cadet was given the choice to rappel from the 57′ platform on a walled side or an open side. The exercise helps cadets build confidence in equipment, trust in others, faith in themselves and the ability to see how they can control their own destiny through the use of ropes. 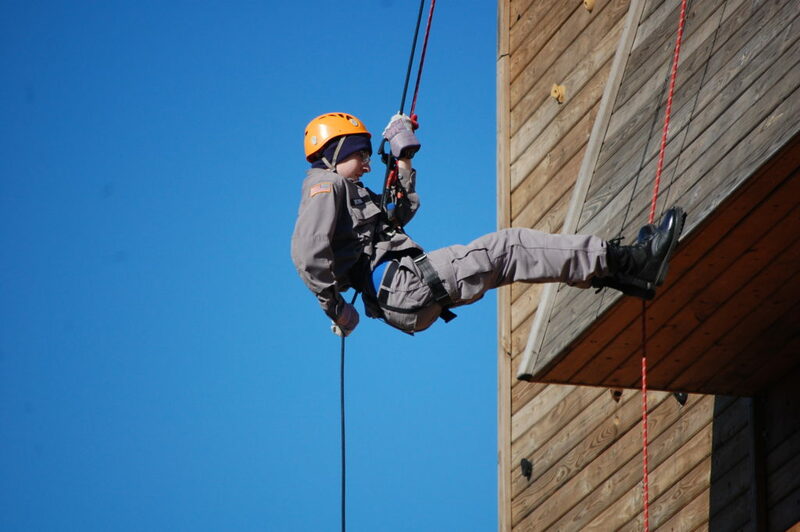 After conquering the tower, many cadets learn they have personal strength to deal with fear and adversity; they overcome their initial fear by focusing and pulling from the inside. While rappelling 57′ is an individual feat, the cadets became closer as teammates by supporting and motivating those who struggled with their own fear of stepping off the ledge making the exercise a confidence and team building exercise at the same time. Be sure to visit our media page for more images from the visit to Camp John J. Barnhardt. Next: Next post: Salemburg Tarheel ChalleNGe Candidates transition to Cadet Status.